Meet your brand new smile at Dental Expressions. Discolored teeth: Sometimes teeth whitening just isn’t enough for serious stains. Also, some stains are intrinsic, meaning they are actually discolorations of the inner layers of the tooth. When stains are intrinsic (which can be caused by medications or dental injuries), topical teeth whitening solutions won’t have an effect. Porcelain veneers can cover these stains and make your teeth appear whiter and brighter. Teeth that have been worn: If you grind your teeth, the top edges of the teeth will begin to wear down. Porcelain veneers can make your teeth appear longer and shapelier. Chipped or broken teeth: A chipped front tooth can really do a number on your self-confidence, and a broken tooth won’t function properly. Porcelain veneers can make your teeth appear whole once again. Other problems that can be covered by porcelain veneers include gaps and even crookedness or uneven teeth. 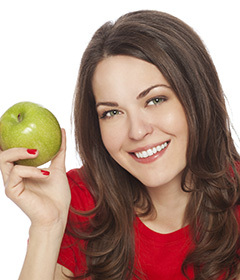 At Dental Expressions near Kaukauna, we offer porcelain veneers to help Fox Cities residents achieve beautiful smiles. First, Dr. Robert or Dr. Heather Heil will meet with you to discuss your smile. If you’ve never visited our office, we’ll find out more about your dental health history, and we’ll ask you about what specific smile problems are making you unhappy with your appearance. We will perform an examination and make sure you understand exactly what to expect from porcelain veneers. Then we will prepare your teeth by removing a tiny layer of your enamel. This makes room for the porcelain veneers to be placed over your teeth. We will make an impression of your prepared teeth, and this impression will be used to have your veneers made at the dental lab. Once your porcelain veneers return from the dental lab, we place them on your teeth, and you have a whole new smile! Porcelain veneers offer a natural-looking way to makeover your smile. Porcelain makes a great material for tooth restoration because it generally doesn’t irritate gums, is stain resistant, and looks a lot like your own tooth enamel. Once your porcelain veneers are placed, you care for them the same way you would your own teeth. You can brush and floss as you always have and maintain a healthy smile. Porcelain veneers will work for most smiles. Contact our Freedom dental office near Kaukauna to begin the makeover process. Patients from the Fox Cities, Appleton, and Green Bay have discovered new confidence at Dental Expressions. Let us begin designing your new smile today.